Hey, remember when we were all nine and read The Giver, because obviously we're all the same age and were assigned the same books in school? I remember that. So that was pretty much my entire exposure to Lois Lowry, and The Giver is not the most "up" of novels. 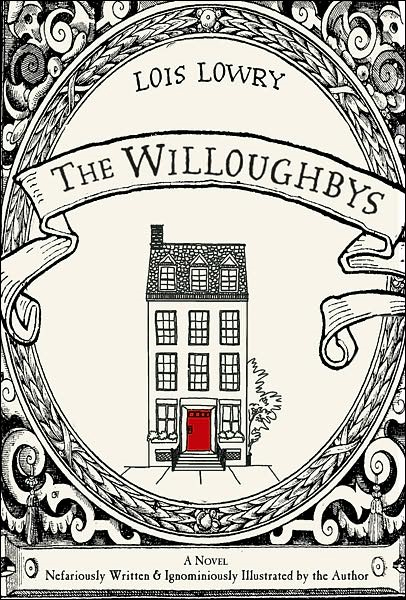 "And then there are the two that I can't tell apart," Mrs. Willoughby went on. "The ones with the sweater." "Yes, them. Why on earth do they look so much alike? It confuses people and isn't fair." "I think this would be easier if we were modern children," Tim said, "but we are old-fashioned. So our choices are limited. Jane?" "Yes?" Jane asked. She was on the floor, playing with the cat again. "I think you must develop a lingering disease and waste away, eventually dying a slow and painless death. We will all gather around your deathbed and you can murmur your last words. Like Beth in Little Women." Jane scowled. "I don't want to," she said. So there's that book. There's also an EXTREMELY RANDOM reference in it to my hometown (Champaign, Illinois) which made me make a 'wtf?' face, because Champaign gets a lot of random references (ok, HAL says 'Urbana, Illinois' in 2001, but they're RIGHT next door to each other) and it's weird because while it's a swell town with a fine, upstanding university that I possibly attended, I wouldn't think it merited more random references than anywhere else. My book on Prussia recently had this sentence: The royal officials appointed to administrative posts in the larger towns did not function as the imperious agents of a central policy bent on disempowering the urban elites. So yeah, I'm feeling a little suicidal regarding that book. But other than that, it's FRIDAY and tomorrow I am being a young 20something and going to brunch, which seems to be what young 20somethings in urban areas do, so that's all just spiffy. And then I shall work on a Doctor/River Song music vid set to a song from the Twilight: Breaking Dawn soundtrack. NO REGRETS IN LIFE. May you all have highly pleasant weekends.